White Cube Bermondsey is pleased to present a large-scale exhibition of works by Beatriz Milhazes. This exhibition foregrounds Milhazes’ explorations in a variety of media including painting, installation, sculpture and collage and her first ever tapestry: a unique, major work created especially for the show. Milhazes has said: ‘I want to have optical movements, disturbing things; such visions that your eyes would be disturbed when you see them.’ Creating what she has termed a ‘dialogue between symbolism and materiality’, achieved through a dense process of physical and conceptual layering, her works employ an abundance of form and colour to offer a vertiginous visual experience. In a new series of paintings, which make reference to the flattened sense of space in Matisse’s paper cut-outs and the colourful compositions of modernist painter and designer Sonia Delaunay, Milhazes continues to employ a bright, riotous colour palette with ‘Neo-Concretist’ and geometric shapes. Circular forms, abstract and floral patterning and solid expanses of single colours are set against parallel or undulating lines; images that echo both the tropical profusion of Brazil’s native flora and the delicate transparency and grid-like features of its modernist architecture. In O grande dia (2016−17) for example, interlocking cog-like shapes, which suggest the interior mechanism of a watch or machine are set against expanding starburst-like lines to create a restless and energetic surface. Likewise, in Sonho Tropical (2017), a series of incomplete semi-circles and circles as well as varied linear patterning draws the eye from edge to edge of the canvas. Milhazes explores a similar language of forms and chromatic focus in three-dimensions with the hanging sculptures Mariola and Marola (both 2010−15). These structures, akin to a mobile, composed of tactile, colourful objects strung along their fine, vertical threads, cascade to the floor. Combining both found and made materials, they are each hung from, and based on, a drawing which Milhazes cuts out of a metal disc, which also forms a kind of ‘ceiling’ for each work. Every element of the sculpture precisely follows this initial plate drawing, creating a play between two and three dimensions and a sense of diagrammatic volume. Likewise, the installation Gamboa II (2015–16) comprises five, highly complex and densely worked sculptures which incorporate a seemingly infinite number of light pastel-coloured plastic objects – the kind commonly used to decorate floats during Carnival processions – into chandelier-like objects. Initially created as part of a stage design for the Marcia Milhazes Dance Company, they will again form the staging for a choreographed performance by the same company, entitled Guarde-Me, taking place during the first week of the exhibition. The centrepiece of the exhibition is Rio azul (2016−18), a large-scale tapestry installed on the back wall of South Gallery II. Inspired by the work of Brazilian modernist artist and landscape architect Roberto Burle Marx, this dynamic, expansive installation, which measures 16 metres wide and is nearly 3 metres tall, is composed of wave-like, linear forms, geometric blocks, circles, leaves and flowers to create a kind of kinetic landscape, as if glimpsed through and behind a screen of botanical and architectural shapes. Made over a period of two years with master weavers at Pinton Mill in France, its multi-hued wool fibres, each one individually hand-dyed, fashion an intricate expanse of lustrous tonal depth and luxurious surface texture. In contrast, Milhazes’ exhibits a new series of small-scale paper collages, also using overlaid elements to create equally dense and complex compositions. 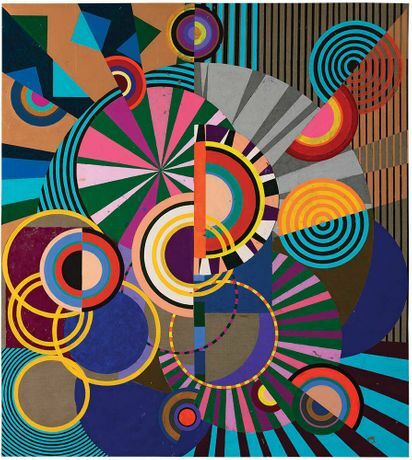 In a similar manner to Milhazes’ paintings, they reference both Brazilian and European abstraction through their multitude of cut-out forms. Incorporating found papers, wrappers and labels with specially printed serigraphic paper in various solid hues as well as fragments of Milhazes’ own screen-prints, their intricate, three-dimensional surfaces appear in relief, allowing the process of the work’s making to be clearly visible.